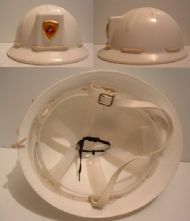 Volunteer's helmet with no name on the badge plate. 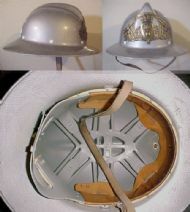 Similar to, but of heavier construction, the other Pettit Collin helmet. 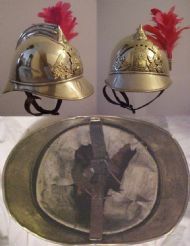 This one has a named badge plate from St.Oger. A EMT/Rescue helmet not intended as a structural fire helmet. From St. Ettienne which is in the Loire region of Southern France. 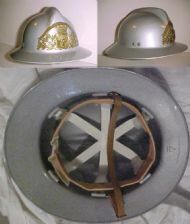 The plume was used to identify officers.